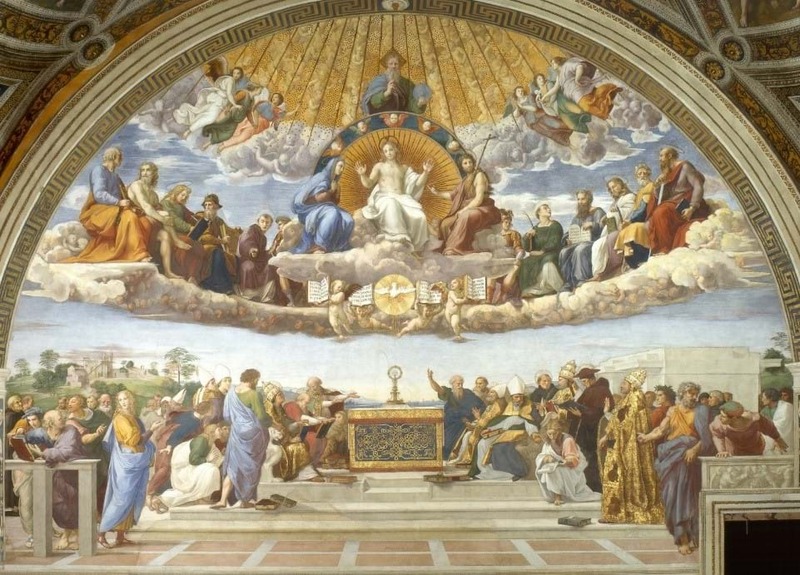 Raphael “Disputation of the Blessed Sacrament,” 1510. When the exact words of Consecration are said by an ordained Catholic priest, the bread and the wine become Jesus’ Body, Blood, Soul, and Divinity. What are these precise words? Do you know what we call the changing of the bread and wine into the Body, Blood, Soul, and Divinity of the Lord? It’s called Transubstantiation (literally “across substances”). This is a very big word, but it’s very important that you remember it and understand what it means. Transubstantiation means that the bread and wine is actually transformed or completely changed. The substance changes, meaning the makeup of the bread and of the wine are no longer bread or wine, but really Jesus. Just because they still look like bread and wine doesn’t matter because what they are now is really and truly Jesus. Some people have been misinformed (they are wrong) and they say that this just a symbol of Him and not the Real Presence of Jesus. This is not true, and you should do what you can to teach them the truth. Many people, even during the time of Jesus, were not able to accept His teaching that the Eucharist really is His Body and Blo... Please purchase this lesson to continue learning.